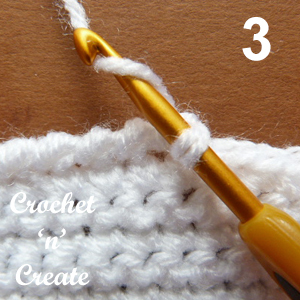 Free crochet crab stitch pictorial – I am sure many of you will have noticed that one of my favorite stitches for edging in my designs is the crab stitch. I feel that it gives a lovely finish and firms up the edge of projects such as baby blankets, booties etc. and also many things for around the home, placemats, coasters, dishcloths and anything that requires a crochet edge. 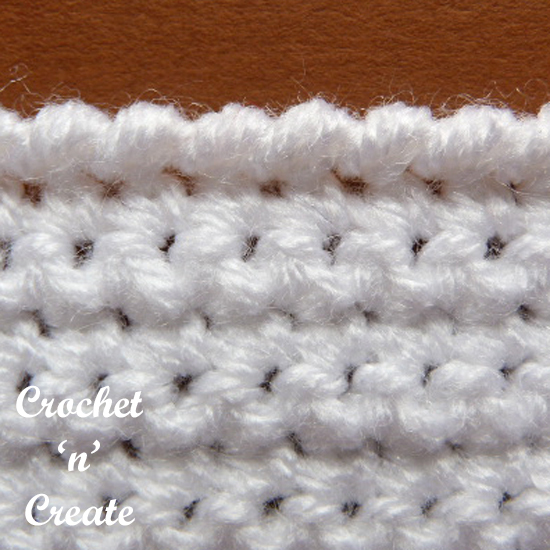 Crab stitch is a fairly easy stitch to do, but can be difficult to master without pictures to show how it can be done. Below is my quick pictorial on how! 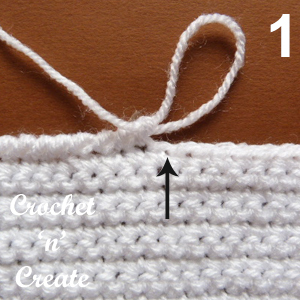 2) Insert hook through the stitch. yo, pull a loop through the stitch, it may be a bit difficult to pull it through at first, but hang in there as it will come out ok.
3) You should now have 2 loops on the hook, yo, pull through 2 loops. 4) Leaves 1 loop on hook. Rpt steps 1 to 4 along your edge to end. 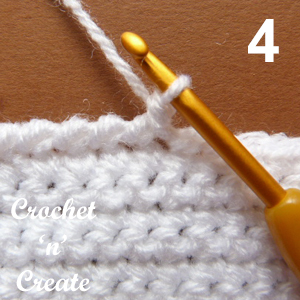 Hope you master this beautiful crochet crab stitch, make sure you pin it for reference to use in future projects. Have fun until next time folks. The written instructions and the pictures for this crochet crab stitch pictorial are copyrighted to crochet ‘n’ create © 2017. You are welcome to sell any finished products made from this crochet crab stitch pictorial, I just ask that you use your own pictures and put a link back to crochet ‘n’ create. 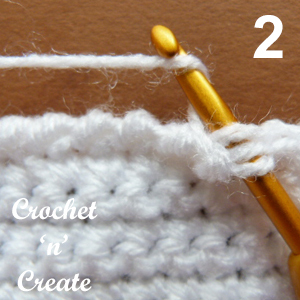 This entry was posted in Crochet Stitches, crochet tutorial and tagged crochet, crochet stitches, crochet tutorial on 27th November 2017 by crochetncreate. Thanks very much for sharing. Wishing you happy holidays!! !